This is Trooper born April 10, 2005. Trooper is loved by the Burton Family especially his momma Carrie. 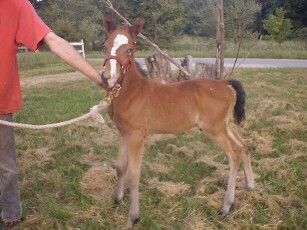 He is quarter horse appaloosa mixed and has blue eyes. Momma found the orphans through a website Daddy found but she had heard about them through a coworker of hers before but hadn't really paid any attention (thank goodness Dad was on his toes). After figuring out that this was the same thing her co worker had mention she badgered her with questions and joined the support group with the plans of learning how to raise an orphan foal and get some educaiton before adopting. Her plans where to adopt foaling season 2006. Well then I came along and stole her heart. 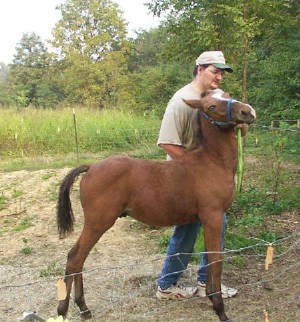 I always knew I was a good looking foal! Well Dad being pratical wanted to look at me in person and since the rescue farm that saved me was only a short trip away they came and visited me. That was on a Wed. Mom fell even more in love with me and Dad was hooked too. I also got to meet one of my two legged sisters that day. You see my Mom had always wanted a horse, you know that one horse that was just for her since she was a little girl. While she tried to own other horses in her life none was just "that" horse. She says all the time that we are made for each other and I am "that" horse. I am so proud! She calls me her "milk baby". So they made arrangements with the Farm to pick me up and bring me home the following Sunday. Well the ride home was scary but I was a good brave boy and made it. When I got to see my new home Mom was bragging on Dad getting it all fixed up since Wed. He did a great job. I love my new home, I have several siblings here, Riddick he is what they call a dog but he could be a small horse. Two animals called goats they like to eat my hay but are ok. Chickens, cats and I get visited by the occasional deer. 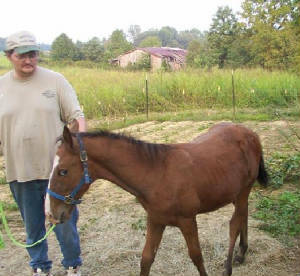 Recently Mom and Dad brought home another horse named Tony, he is older and is great to me. He is for my sissy to ride. He has taken me under his wing and is teaching me how to be a good horse. Mom says that I am special and brags on me to everyone that will listen. She says that she might get us another sibling next season. This has been such and wonderful experience for her raising me. I am now almost 6 months old and weaned. While I miss my milk (who wouldn't) I love grass and the grain they feed me. I am learning everyday too. Here I am as posted on the internet in hopes of finding my "forever" home. It's time to go this way Trooper. "But I want to go this way". Trooper seems to say. Taking a walk. Boy lots of neat things to see and smell.